If you zoom into an image really close, you can see it’s made up of a series of small and large dots, of various colour densities. As you zoom out of the image, these dots give the appearance of continuous shades of gray and colour in an image. The higher the colour density, the larger the dots. The lower the density, the smaller and further apart the dots appear. Most printing presses cannot produce continuous tones, so photographs must be converted into a series of large and small dots in order to be printed accurately. 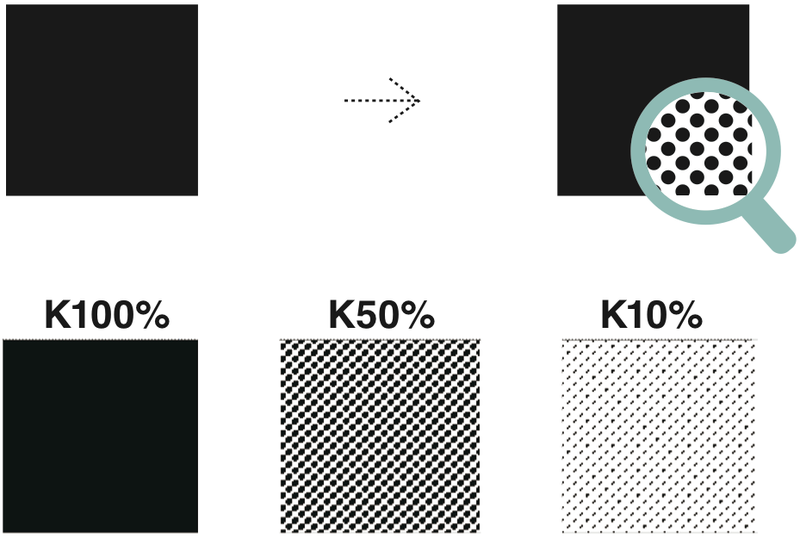 Because of this, designs that use thin fonts, thin lines or colour densities of 10% or less (think K10%) will probably look thinner, because the halftone dots are smaller with more spaces in between them. Please note: Uncoated, grained and textured papers have irregular (not smooth) surfaces. If your design has lots of thin lines, thin fonts or low density colours, they may be difficult to see because they might not print out perfectly on these uneven surfaces. We strongly recommend keeping a minimum line (stroke) width of 0.25 pt and a character (font) size at least 6 pt. Using thinner lines than the above suggested may result in hairlines, which may not print properly.